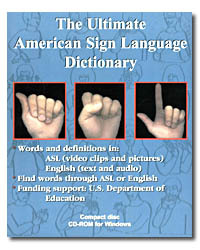 The Ultimate American Sign Language Dictionary is the first sign language dictionary on CD-ROM to be totally accessible to deaf users. Produced by an award-winning team of professionals in the field of deaf education, over three years of research went into the development of this innovative software. Designed to be a true dictionary for deaf and hearing people alike, this package provides an opportunity to discover how ASL signs and English relate through meaning. The meaning of signs that have no single English word equivalent can be discerned (e.g., What's happening? ), and multiple English words that share the same sign (e.g., all, total, whole) can be found by describing the sign. Variations of a single English word that share the same sign (e.g., happy, happily) are shown with the part of speech. The Russian/American and Mexican/American Sign Language Translators provide an easy and entertaining way to learn signed or printed vocabulary in both the signed and written languages. The sign language equivalents of over 575 Russian (or Spanish) and English words can be identified in both RSL (or MSL) and ASL, and translations can be obtained from RSL (or MSL) to ASL and vice versa by way of video clips showing actual signers. The Ultimate American Sign Language Dictionary is the first sign language dictionary on CD-ROM to be totally accessible to deaf users. Produced by an award-winning team of professionals in the field of deaf education, three years of research went into the development of this innovative software. with funding support from U.S. Department of Education. Designed to be a true dictionary for deaf and hearing people alike, this package provides an opportunity to discover how ASL signs and English relate through meaning. The meaning of signs that have no single English word equivalent can be discerned (e.g., What's happening? ), and multiple English words that share the same sign (e.g., all, total, whole) can be found by describing the sign. Variations of a single English word that share the same sign (e.g., happy, happily) are shown with the part of speech. words: in English text, sign pictures, ASL video clips, and English audio. definitions: in English text, ASL video clips, and English audio. Most definitions are reproduced with the kind permission of the Merriam-Webster Company from two of their publications: Meriam-Webster's Elementary Dictionary, and Webster's Third New International Dictionary. Words and their definitions may be obtained by typing the English word (English Search) or by describing the sign (ASL Search). Spell-check and parameter-check features help you find the word even when you spell or describe the word incorrectly. The program will show you English words that share the same sign and signs that share the same English word, so you can choose the precise definition you want. 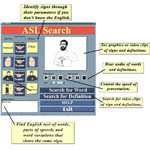 All instructions and information on the CD are provided in ASL video clips, and English text with audio.. Help files provide information about the origins, features, and prevalence of American Sign Language and English and specific instructions on how to find words through either the English or ASL. Drawings of all signs are also included, words can be obtained by typing the words in English or describing them pictorially in ASL, and spell-check is available for English words and parameter-check for ASL words. Words, their part of speech, and their definitions are presented in ASL through videoclips and English through text and audio - no other product of its kind has definitions in ASL, and English definitions have been provided by Merriam Webster. This is a desktop must for any deaf person, family member, or service provider of a deaf person! PC with 500 MHz CPU; 64 MB RAM; Windows 95/98/2000/ME/XP; minimum of 800x600 pixels video display with True color; CD-ROM with 4X speed or better; 16 bit sound card; mouse. 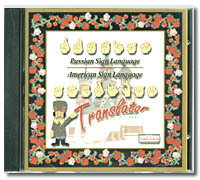 This CD-ROM is an easy, entertaining way to learn signed or printed vocabulary in four languages: Russian Sign Language (RSL), American Sign Language (ASL), Russian, and English. The sign language equivalents of over 575 Russian and English words can be identified in both RSL and ASL, and translations can be obtained from RSL to ASL and vice versa by way of video clips showing actual signers. When opening the program, three boxes and two flags appear on the screen with ASL information on the left and RSL information on the right. The upper boxes contain lists of words in English and Russian. Below the English word list is a box for typing words. Video clips of ASL and RSL sign equivalents will appear where the flags are first shown after the arrow button on the flag is clicked. To select a word/sign, scroll through either the English or Russian word lists or type in letters and/or words in the box provided. Once a word in either language has been identified, click on either video button to see a video clip of the related sign. Pentium II CPU processor or higher; Windows 95/98/NT/ME/2000/XP; 15MB of hard disk space; minimum of 800x600 pixels video display with True color; CD-ROM with 4X speed or better; requires DirectX 8.0 (provided on CD); mouse. 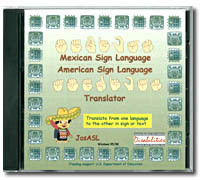 This CD-ROM is an easy, entertaining way to learn signed or printed vocabulary in one of four languages: Mexican Sign Language (MSL), Spanish, American Sign Language (ASL), or English. The sign language equivalents of over 575 Spanish and English words can be identified in bath MSL and ASL, and translations can be obtained from MSL to ASL or vice versa by way of video clips showing actual signers. When opening the program, four boxes and two flags appear on the screen with ASL information on the left and MSL information on the right. The upper boxes contain lists of words. Below the word lists are two boxes for typing words. Video clips will appear where the flags are first shown after a video button is clicked. To select a word or sign, scroll through either the English or Spanish word lists or type in letters and/or words in the boxes provided. Once a word in either language has been identified, click on either video button to see a video clip of that sign. An hourglass appears on the cursor while each video plays. Pentium CPU at 166 MHz or higher; Windows 95/98/NT; 32MB RAM; 15MB of hard disk space; minimum of 800x600 pixels video display with True color; CD-ROM with speed of 16X or better; requires QuickTime 4.0 (provided on CD-ROM); mouse.